For people in war-ravaged regions, safe passage to and from work and school isn’t a given, and cultivating farmland comes at the risk of life and limb—often decades after a conflict has ended. The ground can be so littered with lingering explosives that no one takes walking, driving, or working the land for granted. Live land mines from past conflicts threaten millions of people worldwide. Unexploded ordnance (UXO)—including grenades, artillery shells, air-dropped bombs, and cluster munitions—not only kill and maim the innocent, but they also restrict the vitality of whole communities. The challenge of removing UXO is formidable. But with GIS, awareness of the issue is spreading, and communities around the world are helping to rid the earth of hidden explosives. Maps play an integral role in communication for the HALO Trust, a humanitarian organization that has been involved in demining since 1988. The trust uses GIS to organize demining data, display it on maps, and show patterns that enable basic locational awareness. In addition to working with metal detectors, sandbags, and controlled detonation equipment, HALO’s more than 6,000 extensively trained regional deminers employ GIS to orient themselves on missions, decide which areas to address, determine UXO locations, and depict successfully cleared minefields. Recently, HALO also started using Esri Story Maps to convey the scope of its work in countries such as Laos, Cambodia, Sri Lanka, Zimbabwe, and Angola. Circumstances vary from region to region, but, as the multimedia-rich story maps show, HALO’s goals remain the same everywhere: to protect lives, restore livelihoods, and revitalize communities still threatened by the instruments of war. Visual and textual narratives in this Story Map Journal take viewers on a journey through HALO's surveying, clearance, and community engagement processes in Laos. HALO has been working to eliminate embedded explosive remnants of war (ERW) from the rural eastern countryside of Laos since 2012. US military campaigns there during the Vietnam War, which caused Laos to become known as the most bombed country in the world, left a veritable powder keg in their wake. 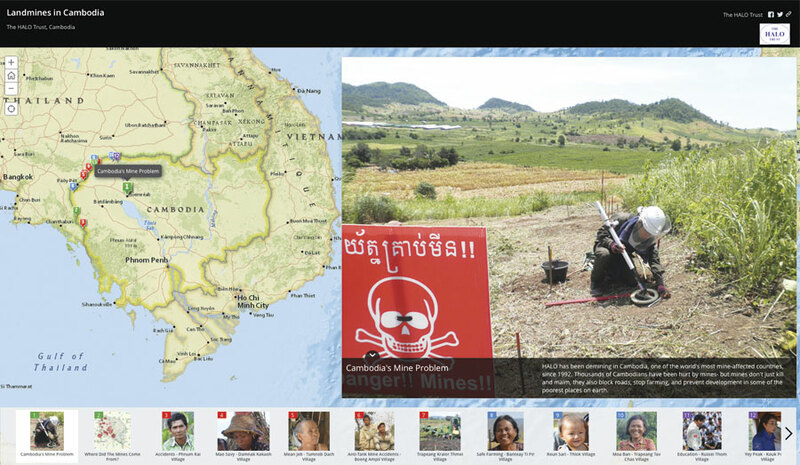 The organization used an Esri Story Maps app to depict how UXO still impact the people of Laos and describe its local demining efforts. In a Story Map Journal, visual and textual narratives take viewers on a journey through the surveying, clearance, and community engagement processes—displaying areas where minefields have been found, showing how the organization informs and empowers community members through risk education sessions, and spotlighting the individuals who are directly affected by UXO. It also exhibits how GIS has contributed to operational decision-making, like when one map juxtaposes the locations of 2 million tons of UXO side-by-side with national poverty data to show the regions of greatest need. In Laos, HALO has cleared more than 16,000 pieces of UXO from contaminated land. Clicking on the thumbnails at the bottom of the Story Map Tour takes viewers to more specific points on the map and enlarges individual stories about how land mines have affected villagers. UXO also threatens Laos’s southern neighbor, Cambodia, which is riddled with land mines laid by the Khmer Rouge, the Vietnamese army, and other militants. More than 64,000 people in Cambodia have been injured or killed by ERW since 1979. HALO started employing local personnel to demine the country in 1992. The staff of 1,200 has destroyed over 220,000 mines to date. 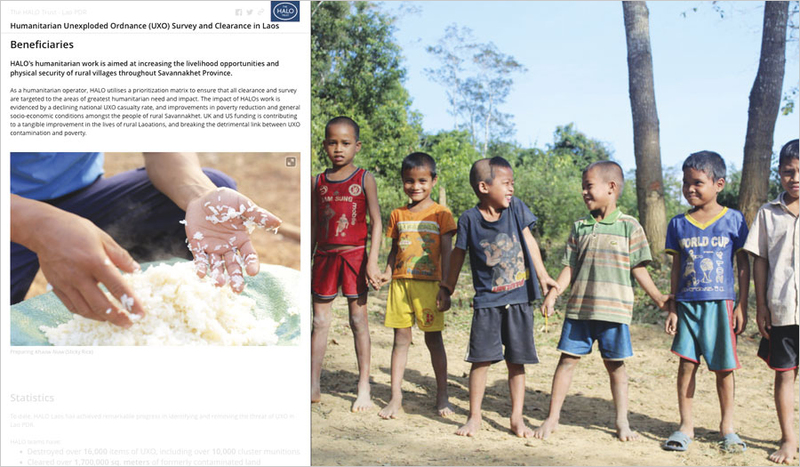 The organization’s Story Map Tour on Cambodia focuses on the effects UXO has had on villagers who live in a largely agrarian society, where families have no choice but to farm perilous fields. Clicking on the thumbnails at the bottom of the map takes viewers to more specific points on the map and enlarges individual stories, from the father who never let his children on the family’s land because he kept finding mines to the woman who had to keep supporting her family despite losing her leg in a land mine explosion near her house. 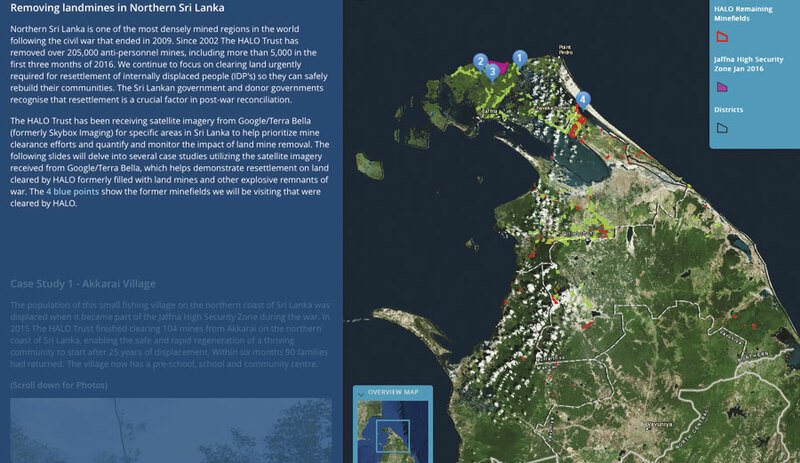 Following HALO's removal of 205,000 mines in northern Sri Lanka, the organization used Story Map Journal to show how this has rapidly reinvigorated the region. Twenty-six years of civil war in Sri Lanka resulted in the country having one of the highest concentrations of land mines on the planet. Although the conflict didn’t subside until 2009, HALO has been actively sweeping minefields there since 2002. Following HALO’s removal of 205,000 mines in northern Sri Lanka—clearing 5,000 from January to March 2016—the organization used a Story Map Journal to show the region’s rapid reinvigoration. Presenting four case studies in the easy-to-navigate format, the story map demonstrates how within months of an area being cleared, homes, schools, and community centers were built on formerly unusable land. Using the Story Map Swipe tool, HALO displays before and after imagery side-by-side to illustrate villages coming back to life—in some instances, even before the organization could completely rid an area of UXO. HALO has restored safe passage in many areas around northern Sri Lanka and has helped community members reclaim their land. Now, communities are restoring fishing villages along the coast and resettling cleared areas that have some of the most fertile soil in the country. 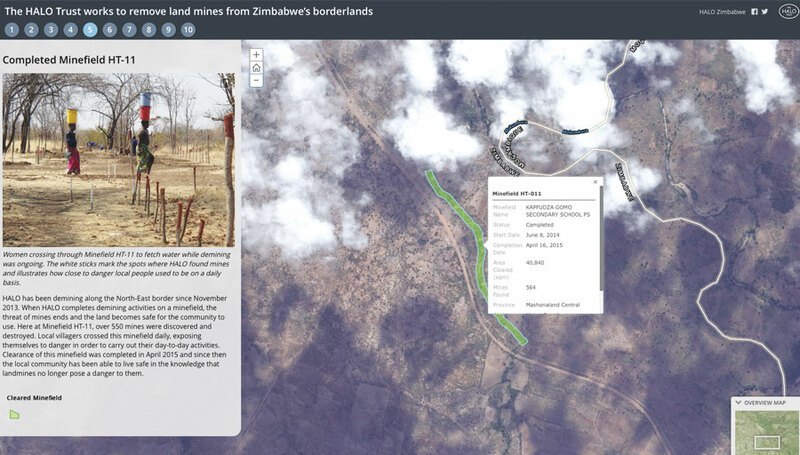 HALO used the bulleted layout of Story Map Series to give viewers an idea of how close to minefields some local Zimbabwean populations live and work. In the borderlands of Zimbabwe, villagers have had to tread lightly for more than 35 years. Civil war in the 1970s rendered the country rife with minefields, with some areas containing as many as 5,500 anti-personnel mines per square kilometer. These ERW limit communities’ capacity to gain access to clean water, cultivate agricultural land, traverse trade routes, and properly implement sanitation measures. HALO used the bulleted layout of the Story Map Seriesto deliver a comprehensive overview of Zimbabwe’s situation. Viewers begin with the history of Zimbabwe’s Liberation War, get an understanding of HALO’s role in removing land mines from the country’s northeastern territory, and see how the process of demining has worked in specific areas. The story map conveys how quickly local people adopt the reclaimed minefields back into their communities and how the reduction of livestock-related accidents has aided economic stability. 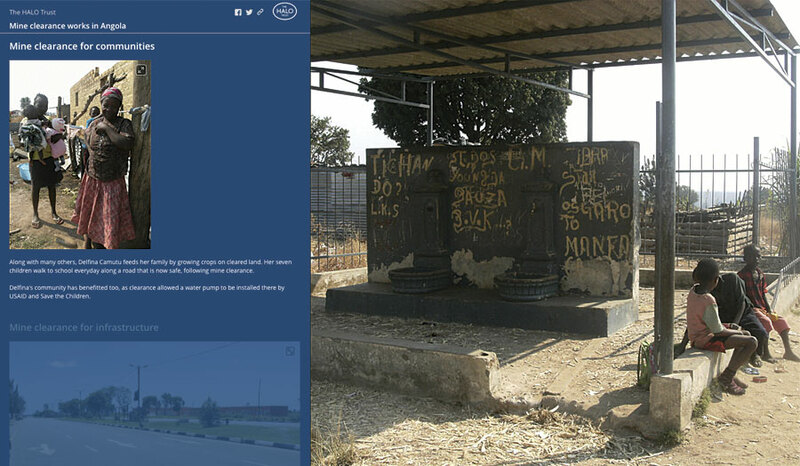 HALO's Story Map Journal on the situation in Angola depicts how mine clearance helps economic development, agriculture, communities, and infrastructure. Like Zimbabwe, the people of Angola experienced a prolonged civil war that left a legacy of UXO that has harmed tens of thousands of citizens even decades after the conflict has ended. HALO’s Story Map Journal on the situation in Angola depicts how mine clearance helps economic development, agriculture, communities, and infrastructure. Removing ERW has enabled new home construction, the installation of water facilities, and the refurbishment of the country’s railway system. It has also made it possible for Angolans to make use of their country’s land again. In two decades, HALO has cleared more than 780 minefields from Angola—much to the benefit of the nation’s increasing population. HALO’s efforts are making communities safer, but there is still a lot of work to be done. 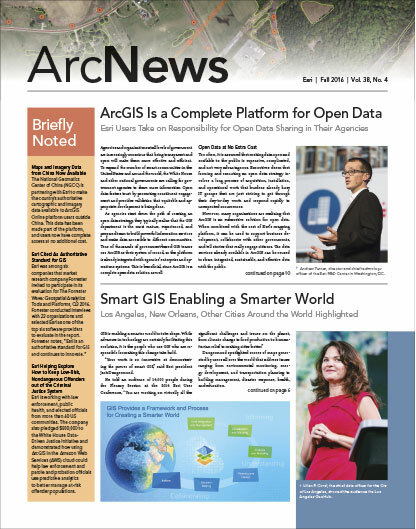 GIS helps HALO focus its efforts in the field, and Esri Story Maps raise awareness of the organization’s cause and work, which is also vital to achieving a land mine-free world.